Do you ever think that all you have to do to survive the end times is to wait for Elijah's call, much like how most Christians simply wait for a “pretrib Rapture?” If so, think again. God's end time safe haven from Wormwood and the Antichrist has a curve ball: the possibility of death by the Holy Spirit. Just like Ananias and Sapphira (Act 5:1-11), if you go into God's community run by a prophet without taming your typical manipulative, prideful, grumbling, or gossiping Christian character, you may end up dead all the same. Find out why this will happen (again), how to tell if you are at risk, and how to change yourself now to avoid this for you and your loved ones who indeed likely will ride your coattails to safety. I'll tell you there is no pretrib rapture  (sorry, wish there was). I'll tell you why the latest “sign in the sky” invented prophecy theory is false . all the while stressing that God is good, he has a plan and there is no reason for those who love God and want to serve him to fear missing out on his escape plan . True to form, I'm going to share something new that may make you uncomfortable at first. I do so because I know it is better for you to learn this now rather than later when you will have less time to act on it, or even worse, never learning until you find out the hard way...potentially when you "wake up dead." As much as I want you all to get excited about expecting the coming of Elijah and his call to flee to safety in Israel where we live on a kibbutz together for a few years , I have to caution you. If you go into that community unprepared or or you don't really belong and fit in there, it can cost you your life. Where do I get this from? From related stories in both the OT and NT. I've often said that the scariest prophecy for Christians in the Bible is where Jesus predicts many Christians will be told “Depart from me, I never knew you”  when they are rejected at the rapture (Mt 7:21-23). Now I'm going to tell you what is perhaps the runner up nightmare scenario for Christians from an incident that already happened 2000 years ago. Acts 5:1-11 (NIV2011) — 5 Now a man named Ananias, together with his wife Sapphira, also sold a piece of property. 2 With his wife’s full knowledge he kept back part of the money for himself, but brought the rest and put it at the apostles’ feet. Can you imagine? How can a good God put believers to death for something so benign and trivial? That's not so easy to answer. Indeed, most believers not only cannot understand this story, they lose their faith over it seeing believers like them killed by God. They have to skip over it like some do with Matthew 7:21-23 or the entire Book of Revelation. If you check the Wikipedia article on Ananias and Sapphira, you'll find there is quite a bit of confusion and disagreement on why God did this...if he did it (?). Definitely no comforting answer that takes it at face value and makes God still good. The key is to focus in on Peter's statement “you have not lied not to men, but to God” (Acts 5:3) combined with an understanding of the principle of accountability that Jesus taught (Luke 12:47-48). Under normal circumstances when you lie, deceive and try to make yourself look better than you are, like Ananias and Sapphira did (by claiming they sold a property and donated all the proceeds, withholding nothing for themselves), you're only messing with a fellow child of God who are there for us to practice on and learn with. We all practice on each other in a safe environment and hopefully find out through trial and error that our self-centered ways do not work. You're not immediately accountable for your mistakes in this environment. Judgment is withheld until judgment day, whenever that comes for you. However, this "low-acountability, few stripes" expectation is no longer applicable when you find yourself in one of the very rare times and places in history where a proven representative of God is in authority over you. The prophets like Moses and the apostles like Peter were like that. They were filled with the Holy Spirit and did miracles and signs to prove that God had selected them to deliver revelation and commands to those under them. This puts you into a "high accountability, many stripes" situation. To then disobey them or challenge them therefore comes at a much higher price as Korah found out with Moses (Num 16:32). So did Moses' brother Aaron and sister Miriam (Num 12:10). Same goes for anyone trying to pull the wool over the eyes of such a leader to gain favor or make yourself look good. That's the situation that Ananias and Sapphira found themselves in among the saints under the apostles' leadership: a theocracy. Peter had healed many people, cast out demons, and done signs and wonders. If you didn't know God was with Peter, you were living in a cave. To still practice deceit on this person who the Holy Spirit speaks to and works through was equivalent to tempting and provoking God. God is holy. If it's impossible for even righteous mortals to see God and live, there also must be a penalty for tempting someone who the presence of God is in so strongly as it was with Peter or Moses. Numbers 12:6-8, 10 — 6 he said, “Listen to my words:“When there is a prophet among you, I, the Lord, reveal myself to them in visions, I speak to them in dreams.7 But this is not true of my servant Moses; he is faithful in all my house. 8 With him I speak face to face, clearly and not in riddles; he sees the form of the Lord. Why then were you not afraid to speak against my servant Moses?” … 10 When the cloud lifted from above the tent, Miriam’s skin was leprous[a]—it became as white as snow. Peter was not quite on par with Moses, but you can see how the same principle would apply given the miracles that were done at his hand like Moses' hand. 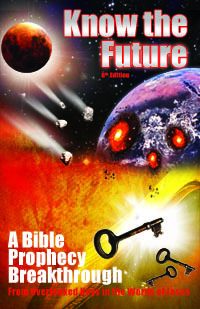 What this means for us is that when Elijah comes and calls workers to God's kibbutz in Judea starting in 2022 , it will again be one of these historically rare situations of a high accountability theocracy; a camp run by leadership by God under Elijah and other prophets that will no doubt be created then (Joel 2:28). That makes very costly to behave in certain ways that under normal circumstances you may at worse only classify as a “learning experience” and move on. Given that, we need to beware. The typical Christian plan to just wait until the pretrib rapture comes with no individual, personal effort at investigating or learning how to actually do what Jesus said could be trouble. I have written about this same issue in my article on the Rapture Requirements . I explained how Christians think Jesus is so extremely impressed when someone simply accepts him, that they think it's enough for him to grant them salvation. Christians generally don't realize that the title "Lord" means it's someone you obey. Because believing in/accepting Jesus is not enough to make the rapture, this explains why so many will hear “depart from me” from Jesus (Mt 7:23). They had not learned to do the “will of the Father” (Mt 7:21). Religion proved no substitute for personal Bible research. Just like with the rapture, you will need more than to show up where Elijah says to go if you want to make it. You'll need to prepare yourself. The good news is the preparation is nothing more than what you should have been doing all along if you call Jesus Lord. Now you have an extra pointed reason to get serious about being about the Lord's business. Those who come to the rapture unprepared go on to weep and gnash their teeth. In the camp you could die from your present unloving, faithless, rebellious, complaining habits that you share with other unprepared Christians waiting for the rapture in vain. You don't want to end up “out of the frying pan and into the fire” when you run to where Elijah says to go, last minute, without any soul-searching and spiritual preparation. Get to work on now on finding out what Jesus said and do it (Lk 8:21). Good News: Your Loved Ones May Come After All, But Will They Be Safe? This goes double for your loved ones who, despite how it appears to you now, I am telling you have an excellent chance of following you there. I say this here because one of the most common concerns I hear from my readers is their failure to reach friends and family members. They just won't listen to them. My comforting answer to this concern is that God knows how distracted, hardhearted and hurt most today are. He also knows what it takes to get their attention. They may not listen to you, Tim McHyde or my writings, but Elijah will be much more convincing. He must be pretty convincing to break through all the psychological barriers in God's modern, rich, lukewarm, Laodicean church-era saints (Rev 3:16-17). Plus, as your loved ones see other people leave for Judea, people they respect more, they may experience FOMO or “fear of missing out.” What if they're wrong and end up paying the ultimate price? Besides, if others they know are going, it won't be so scary to tag along. This will tip many on the fence over the edge to coming. Bad News: They May Be Most "At Risk"
That said, I worry about these people who decide to come last minute for less than ideal reasons like the rest of us who go early and excitedly. According to the historical precedents in OT and NT this type could be "at risk." They are going in with less preparation of how to behave respectfully and fit in. What especially makes me think of this is, according to the Torah, in one instance where many died from God's plague (Nu 11:33-34), the complaining (Nu 11:1) that led to this judgment began with the rabble of Egyptians who came with Israel at the exodus (Nu 11:4). They were craving meat and other things they behind in Egypt and began complaining against Moses and the manna (Nu 11:4-6). What do I recommend you do about this? My blanket instruction of course is to seek to understand and do the Word of God, especially Jesus' words, just as he himself said (Lk 8:21). That's what I did to get to see the things I'm sharing. Personally, I began by quitting church because as long as I depended on my pastor to research the Word and teach it to me, I was not taking my salvation into my own hands, or working it out myself (Php 2:12). But your path may follow a different course. Achor – Swallowed alive by the earth. This is an example of simple direct disobedience to a command from the prophet. Onan – Slain by God. Did not obey his father Judah (and the later Levirate law) to impregnate his dead brother Er's widow, which would have economically hurt him to have half of the inheritance he would have had his older brother not have an heir. Notably, no prophet was even involved here as the disobedience to Judah was enough. Lesson: Onan's selfishness led to his disobedience and punishment from God. Lesson: Many Christians get dreams and think they hear words from God. That's OK, maybe confusing today. In the camp ahead, it can lead you to think the leaders are wrong and want to take over because God's speaking to you differently. I have had many prophets write me warnings saying I'm wrong for not listening to them or for "mocking" them (by debunking their invented prophecy theories). I expect these types to become the modern Korahs in Judea. Miriam — Cursed with divine leprosy (until Moses prayed for her healing). Miriam along with Aaron accusing their brother Moses of misconduct regarding his wife. Lesson: Coming from our Western democracies with freedom of speech, we expect to have an opinion and/or a say on everything. But that's not how it works in a theocracy or even a monarchy (Ecc 10:20) and we'll all need to adjust to this and control our tongues (Jas 3:2). Gehazi – Cursed with divine leprosy like Miriam. He lied to take the prophet's gift for a healing because of resentment against the foreigner who received it. He also was second-guessing the decision of his prophet leader in not accepting the gift. Ten Spies of Canaan — Killed by God. Moses sent twelve spies into Canaan and ten came back with a discouraging, negative, false report about the giants being too big to defeat. This led to crying, complaining and refusal to obey God and take the land. Many died as a result. Lesson: Faithless, negative, pessismistic gossiping about the camp like we see at church about the leaders can have serious consequences. I hope the examples above give you some helpful food for thought. Update: A newer article details ten obstacles that may work against preventing you from even making it to Judea . Bottom line, all the ugly behavior that Christian culture is known for and we today put up with at church, the judgmentalism, sectarianism, gossiping, accusations, rebellion, religious-policing (saying we must keep this or that doctrine as they understand it), etc. These behaviors won't work for us anymore in the camp of the saints and are sure to have much bigger consequences than they do now. In the past we have all had the time and freedom to play around and work on our bad habits at our own pace. I'm sorry to say time is running out for procrastination. It's time to start working on what you've been putting off. Like myself, you probably already have some ideas of where you need to focus. You may not know how yet. God knows. Go to prayer and tell him you read this article and don't want to procrastinate anymore but you need his help to know what to do and how to do it until you overcome it. Rinse and repeat. Philippians 1:6 — For I am confident of this, that He who began a good work in you will continue to perfect it until the day of Christ Jesus. That means God will help you to do this work if you are serious and ask. If you want to help yourself with many testimonials and keys for overcoming from Katrina and I, consider checking out the supporter content . Joining the support team will help you with guidance on real repentance that you may need, and it will help us to continue writing articles like this and eventually the free workbook to guide all believers to get On the Narrow Path  and stay on it.